Ah, the city with the most observant Jews (New York) gets you on Rosh Hashana. Alas. Maybe next time. These events you just listed, including the Sep 30 event, aren't the official Graveyard Book Tour, right? Ordinarily I'd assume the Book Tour wouldn't be until the book has come out, but I know that this tour will be more of a reading/Q&A tour rather than a signing tour, and if it's not a signing, then the tour can start before the book is available. It would be awesome if all publicity/scheduling people had a big calendar with every religion's holidays, along with demographic maps showing which places have a lot of which religion. A few years ago Daniel Handler (Lemony Snicket's ammanuensis) and I were grumbling together about the way that, probably thousands of years ago, it was decided that the Jewish High Holidays would fall in High Publishing Season, and how unfair this was to Jewish authors and their readers and, nu, what were you going to do about it? But there is an event to make up for my being in New York on Rosh Hashana: On November the 9th, which is a Sunday, I'll be In Conversation With the amazing Chipp Kidd, at the 92nd St Y, talking about 20 years of Sandman. And I'll be signing stuff afterwards, if the last events I did at the Y are anything to go by. implication is that everything else is distinctly unsuitable. Well, who knows? I was interviewed in Locus this month (the one with Garth Nix on the cover), and tried to say something very much the same about Young Adult fiction: that young adults (and older kids) should be reading everything, relentlessly. They should be reading outside their comfort zones, because the training wheels have come off, and that's the only way they'll find out where their comfort zones are, reading everything. 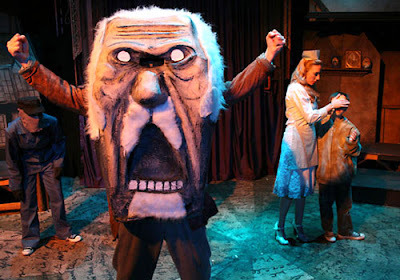 There's an article about the revised and retooled theatre production of Mister Punch in LA today at http://www.latimes.com/theguide/performing-arts/la-gd-perf17-2008jul17,0,4577290.story -- with a marvellous photo, which looks strangely McKeanish (see below). It's an interview done with me last week when I'd just got back from Brazil and was slightly under the weather, but the reporter has made it sound like I was still making sense. WHERE: Bootleg Theater, 2220 Beverly Blvd., L.A. WHEN: 8 p.m. Fri., 4 and 8 p.m. Sat., 4 p.m. Sun. ; ends Aug. 31. (no perf Aug 8-10). ZZ9 Plural Z Alpha did a run of 50 black on black Disaster Area t-shirts in the late 1980s. There were also yellow on black and white on black versions but the last was sold around 2001, and they have not done a reprint since then. Someone asked what sizes the various tee shirts are. They range from xxl down to the ones where I'm not sure how I used to get them on and am certain either the shirts have shrunk or I used to be a lot smaller. So from Too Huge For Me To Wear down to Really Bloody Small. My Mom is the volunteer creative director for Children's Culture Connection (CCC), a non-profit organization working with 12 international charities to help children in America, Haiti, Vietnam, Iraq, Afghanistan, Guatemala, India, Peru, Kenya, Nigeria, China, Bulgaria and Russia. CCC has raised thousands of dollars to help empower and connect the children of the world, built houses in Vietnam, installed water pipelines in Sri Lanka to bring clean water to orphanages, sent kids to school, helped with medical supplies in the Amazon jungles, organized art projects with children in seven countries. and more...it is really amazing. Feeling very inspired by the lessons learned from my mother and her spirit of giving, I am working to help Children's Culture Connection raise awareness, as well as send art supplies to the children of the world. I've just re-developed my website (www.kellibickman.net) and will donate 20% of the sale of any works of art to buy art supplies for these children and help them to expand their imaginations and their world.